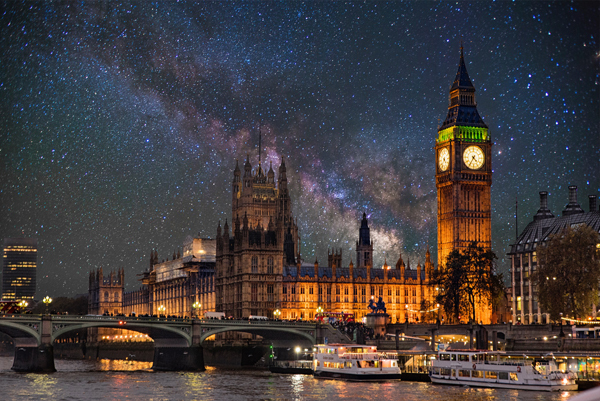 A smaller scale albeit spectacular view – in this one, the focus is on a particular building – but among the most splendid views of London is that of the Houses of Parliament (aka The Palace of Westminster) from across the Thames. Featured in various ways in numerous films and TV shows (1980s sitcoms Yes Minister and Yes, Prime Minister among them) as well on bottles of HP Sauce, the iconic view from the east bank of the Thames, taking the facade of the building with the bookends of Victoria and Elizabeth Towers, has only been around its current form following the completion of Sir Charles Barry’s gothic masterpiece in 1870 (although the Palace of Westminster and adjacent buildings have occupied the site for far longer). The site, along with the neighbouring Westminster Abbey and St Margaret’s Church, is protected as part of the UNESCO World Heritage List, the official listing of which notes that the “iconic silhouette of the ensemble is an intrinsic part of its identity, which is recognised internationally with the sound of ‘Big Ben’ being broadcast regularly around the world”.